Compatibility problems? 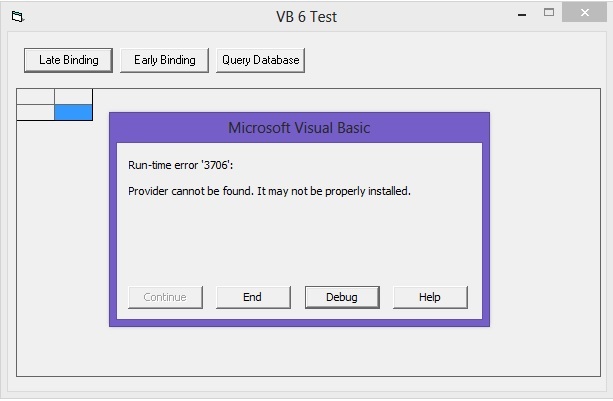 Visual Basic 6.0, released in 1998, is not officially compatible with Windows 8 Pro 64 bit… or Windows 7, or Windows Vista. But I still like the language a lot for its simplicity, rapid development, and significant pre-existing code base within my company. Of course, Oracle Database 11.2.0.3 and the Oracle Client 11.2.0.3 are not officially supported on Windows 8, so maybe the quest is an exercise in futility. Roughly a month ago a thread appeared on the OTN forums asking how to connect Visual Basic 2010 to Oracle Database Personal Edition on Windows 7 Pro 64 bit running on the same computer. Several people offered very good advice to guide the OP. 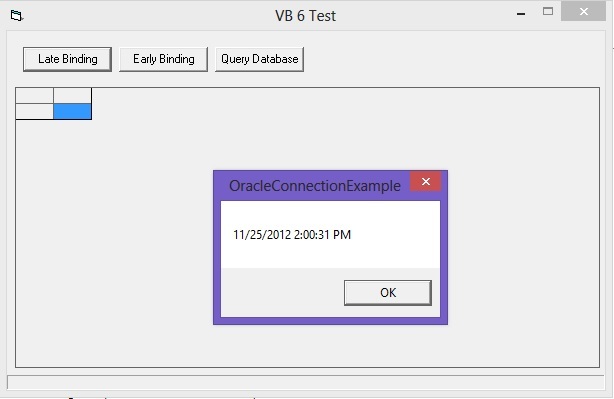 The OP eventually asked how to connect Visual Basic 6 to Oracle Database Personal Edition running on the same Windows 7 Pro 64 bit computer. As I mentioned, Visual Basic 6 is not officially compatible with Windows 7, and the fact that it is a 32 bit application running on a 64 bit Windows computer means that the 32 bit Oracle Client must also be installed on the computer. Using Visual Basic 6.0, or any development environment for that matter, requires that certain components be selected for installation when installing the Oracle Client. At a minimum, Oracle ODBC Driver 11.2.0.x.0 (for ODBC type connections), and Oracle Provider for OLE DB 11.2.0.x.0 (for OLE DB type connections) must be installed with the Oracle Client. strSQL = strSQL & "  DUAL"
ADODB cannot find the OraOLEDB.Oracle provider. I am sure that I installed that component when installing the 32 bit Oracle Client on the computer. The Visual Basic code that was added to the Late Binding command button is very generic. 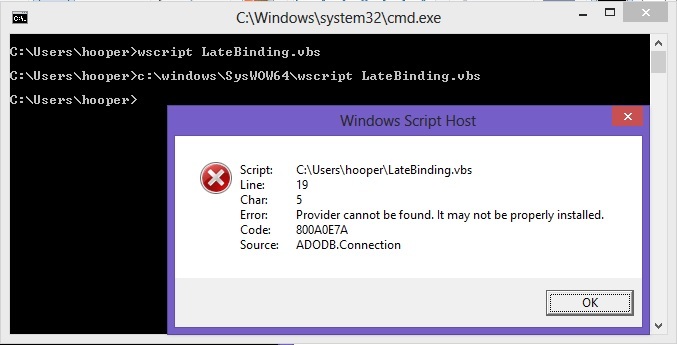 In fact, as written the code can be placed in a plain text file with a .VBS extension and executed as a VBScript file with either the wscript or cscript command. 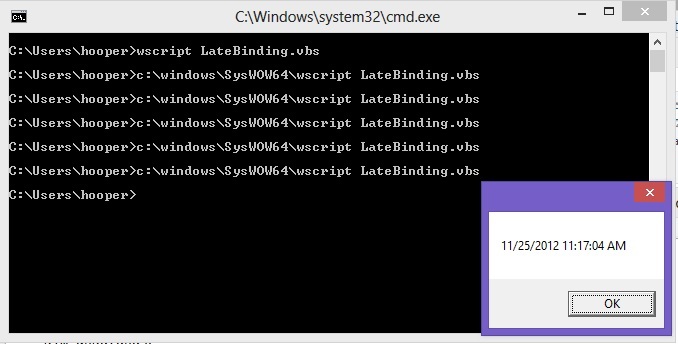 Copy the code from the Late Binding command button into a plain text file (start the Notepad program and paste the code), then save the file as “LateBinding.vbs” (including the quotes). 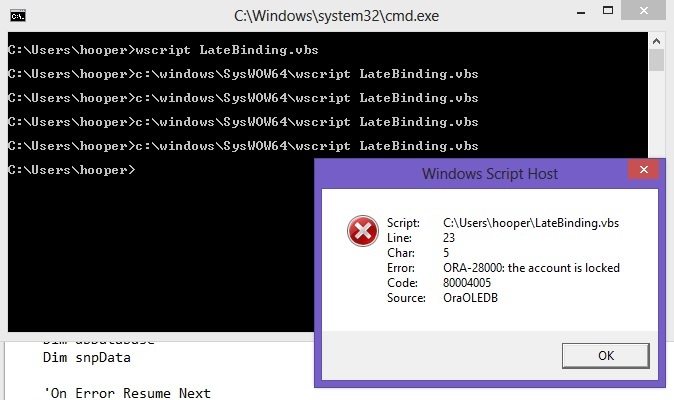 Note that this time the computer indicated an ORA-12154: TNS:could not resolve the connect identifier error, rather than a Provider could not be found error – we were hoping to obtain the same ORA-12154 error as we did when working in Visual Basic 6. What changed? Well, this is a 64 bit computer, so the 64 bit wscript program was used, which used the 64 bit Oracle client (actually the 64 bit Oracle Database home files). Yes, the file is in that location. Is the Oracle Client 11.2.0.3 just not compatible with Windows 8 Pro? The Oracle Client 11.2.0.3 seemed to work as expected on a computer that was upgraded from Windows 7 Pro to Windows 8 Pro, including the OLE DB functionality, so why will that functionality NOT work on a new computer with Windows 8 Pro installed? @="Oracle OLE DB Error Lookup"
@="Oracle Provider for OLE DB"
After verifying that the Oracle Client’s home on the Windows 8 Pro computer was in fact located in C:\Oracle\product\11.2.0\client_1 (it may not be on your computer, change the above registry files as necessary for your computer – use two \\ characters for each \ character that normally appears in the path to the Oracle Client’s home), I imported the registry entries into the Windows 8 Pro computer’s registry by double-clicking each of the files that were exported from the Windows 7 Pro computer. Well, that is not good, another error message. 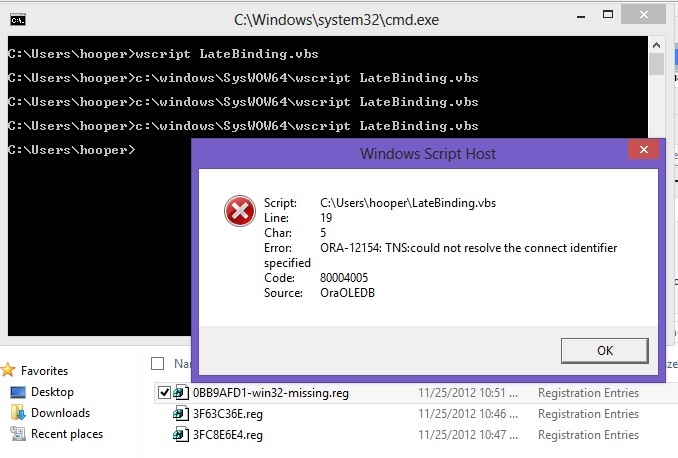 But wait, that was the same error message displayed when the 64 bit wscript was used to execute the script file. Maybe we are making progress. Let’s fix the LateBinding.vbs script file so that the strDatabase variable is set to a valid database name found in the 32 bit client’s tnsnames.ora file (I will use a database named sample, which has the Oracle sample schema loaded), the strUserName variable is set to a valid database username in the database (I will use the sh user), and the strPassword variable is set to the correct password for the username. dbDatabase.ConnectionString = "Provider=OraOLEDB.Oracle;Data Source=" & strDatabase & ";User ID=" & strUserName & ";Password=" & strPassword & ";ChunkSize=1000;FetchSize=100;"
strSQL = strSQL & "  CUSTOMERS"
Wow, 55,500 rows in that sample table, that is a lot of rows. Finally, let’s add the code to the Query Database button. 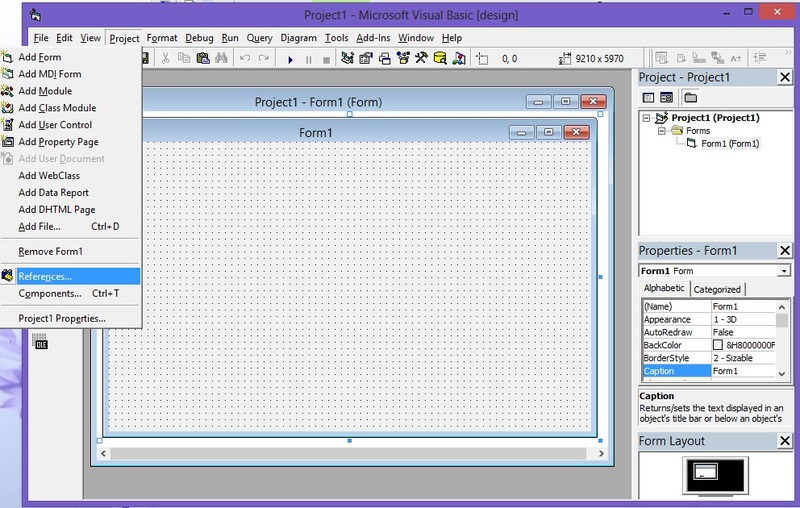 This code will use early binding, bind variables, and present the result rows in the grid control. strSQL = strSQL & "  CUST_FIRST_NAME= ?" What does the output look like when the above code is executed? Nice! Now the problem. It is a very bad habit to repeatedly connect to and disconnect from the database, and such a habit may result in a variety of problems, including performance problems. Ideally, the code to connect to the database should be relocated to a different part of the program, possibly the Form_Load subroutine. I have not yet verified whether or not the same issue exists with the 11.2.0.4 client, however that client version may be downloaded here once you have logged into the My Oracle Support website. The above method fixed the problem with the 11.2.0.3 client (even on the Windows 10 beta versions) without any identified side effects. Answering Vani’s comment stating that the ODBC drivers are not available with the 12c client. It is typically necessary to perform a custom install of the Oracle Client or Database for the ODBC drivers to be installed. Because Visual Basic 6.0 is a 32 bit program, the 32 bit Oracle Client (or Database) software must be installed, even if the database itself is running on a 64 bit server in a 64 bit Oracle Database install. If during the install “Oracle Windows Interfaces 12.1.0.2.0” is selected, you are then able to install the Oracle ODBC drivers – I suggest installing the other items also that are checked in the below picture. 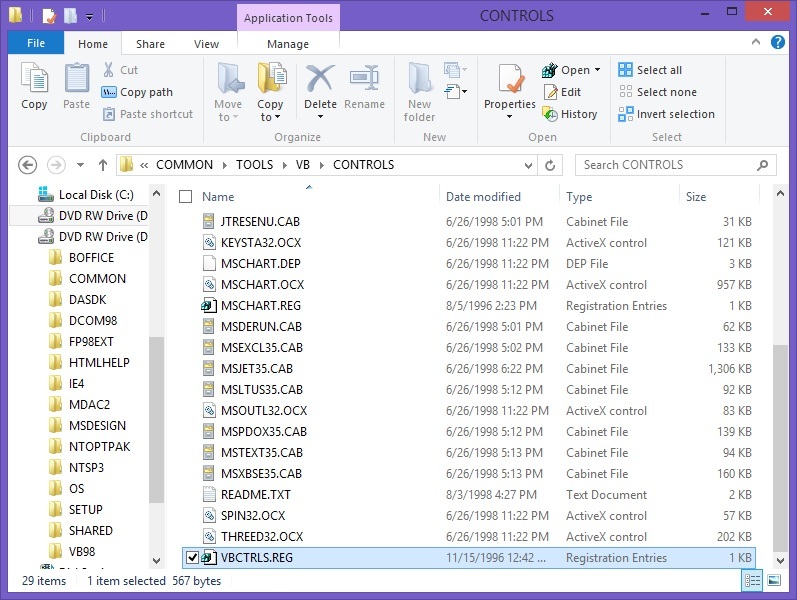 On 64 bit Windows 7.0 and 8.0 you must use the 32 bit ODBC Administrator to add ODBC connections that may be used in Visual Basic 6.0. You will find the 32 bit ODBC Administrator in the C:\Windows\SysWOW64 folder, as shown in the picture below. It has been a couple of months since I last checked, but I think that with Windows 10 32 bit and 64 bit ODBC configuration is setup using just one tool that is available from the Windows Settings applet. I have always set up System DSNs for ODBC connections to an Oracle database. 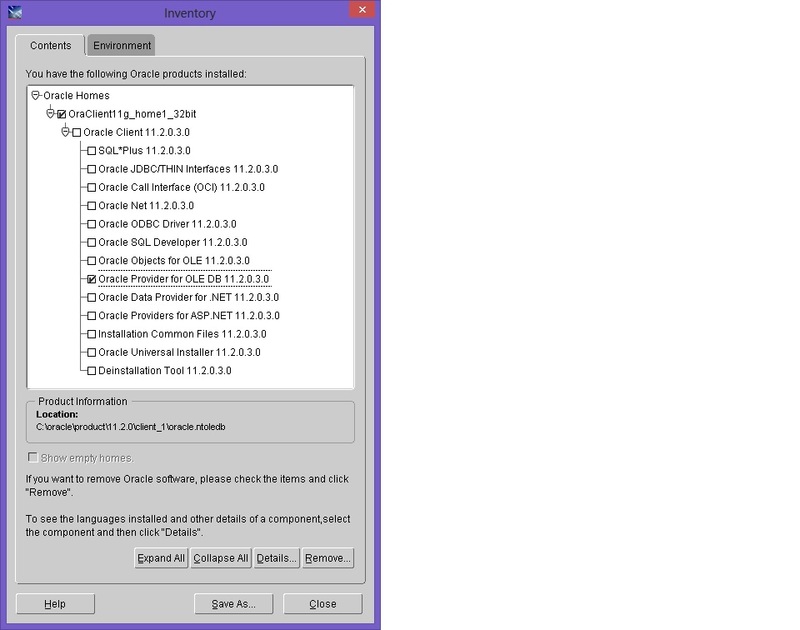 As shown in the below picture, there are two Oracle database 11.2.0.x ODBC connections configured on this computer. I’d like to THANK YOU VERY MUCH !!!!!!!!!!!!!!!!!!!!!!!!!!!!!!!!!!!!!!!!!!!!!!!!!!!!!!!!!! To fix the above error message, I would need to add an entry into the tnsnames.ora file in the correct folder location in the Oracle client’s home for the undefineddb. My users don’t have Oracle Client Installed in their PCs, will still able to access the database using the code mentioned above. 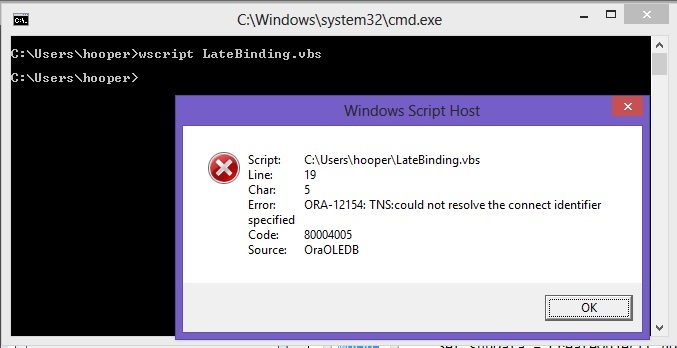 Without the regular (or instant) Oracle client, a Windows computer would not know how to resolve the Provider=OraOLEDB.Oracle in the connection string. 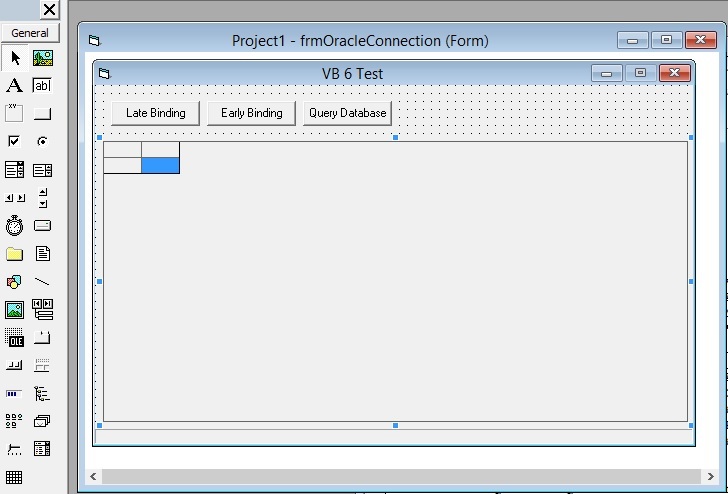 Yes, it is possible to connect VB6 to a 64 bit Oracle Database 10.x database. The key requirement is that you MUST have a 32 bit Oracle client installed on the computer that will run the VB6 generated program, because VB6 generates 32 bit programs. However, you must install and configure a 32 bit Oracle client that is compatible with the version of Windows – the 11.2.0.x Oracle client that I mentioned in this article is probably the best choice for Windows XP and newer. I am having problem in creating file dsn on windows 8 64 bit machine. 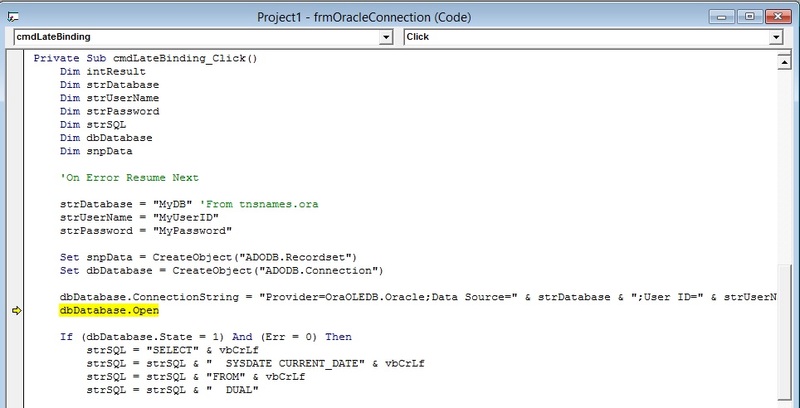 As I want to run my project developed in vb6 need to be connected with oracle 12c 64 bit database using dsn, but there is no odbc driver found for oracle. See the May 11, 2016 update that is included in this blog article – that update is specific to your question. 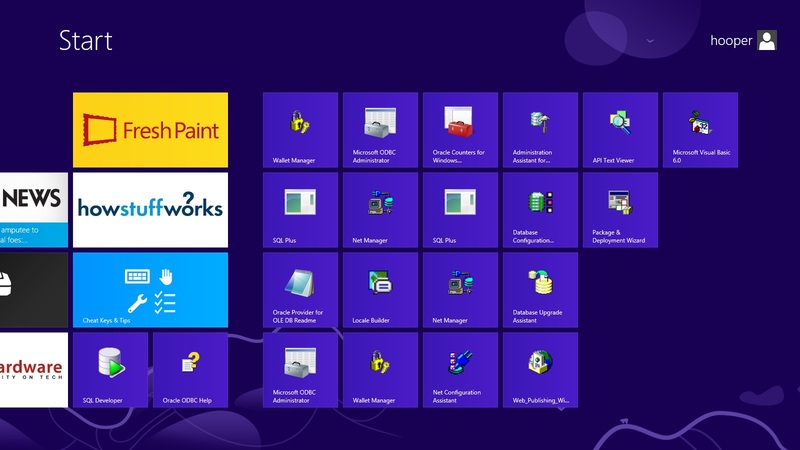 The screen captures are from 64 bit Windows 7, but the concepts apply to Windows 8.0 also. 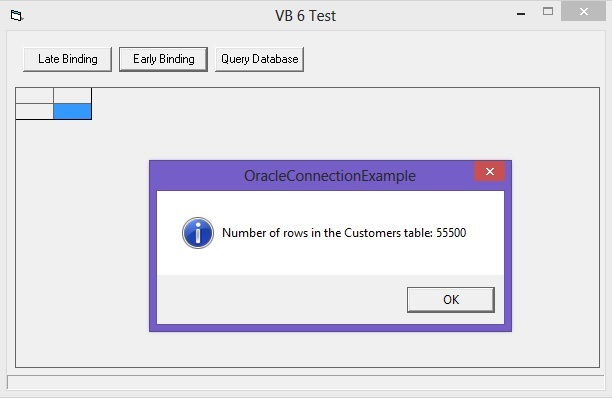 Once you are able to connect to the Oracle database from VB 6, simply formulate SQL statements to carry out the required tasks, wrap VB 6 code around the SQL statements, and then send the SQL statements to the database (and process the resultset in the case of a SELECT). Ideally, your SQL statements would use bind variables rather than literals (constants) in the SQL statements. Take a look at the examples in the following link – the programming syntax used in an Excel macro is almost exactly the same as in VB 6. The VBS examples are quite similar, except that all variables are considered variants (no declared variable type). I am trying to run a VB6 program that uses Oracle 9.2 version & I am getting an error” activex cannot create object”. Searched Google for CORE35.dll and ORA73.dll, and found a couple of discussion posts from 1998 to 2004. The name ORA73.dll suggests that this application expects to work with the very old 7.3 Oracle Client software, and a few people with Oracle 8.x clients reported that their “new” Oracle client did not include CORE35.dll. 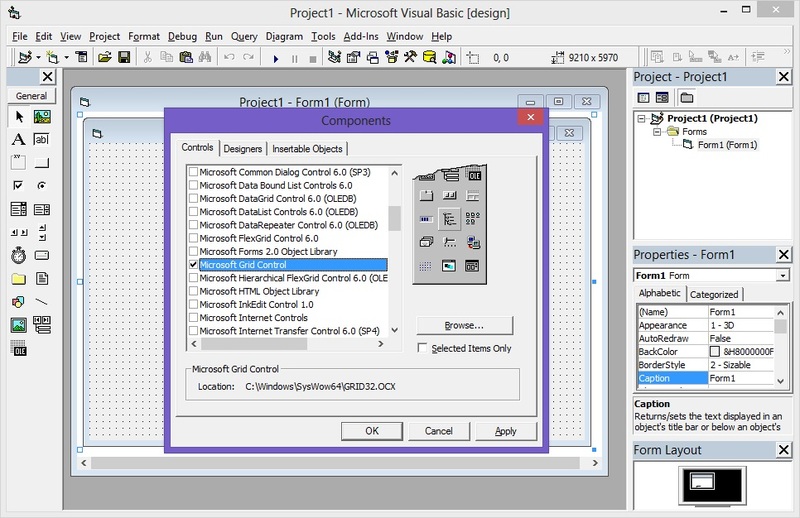 This VB 6 program may be using connection functionality that is significantly different from the focus of this blog article. 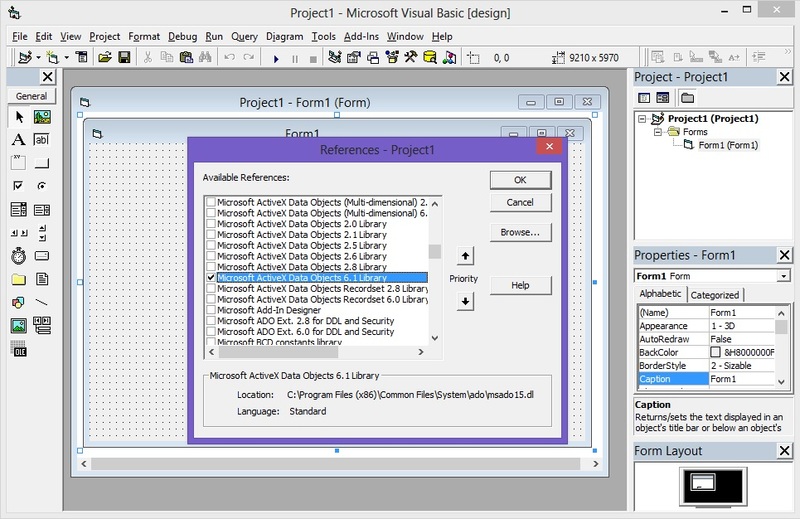 If you have the source code of the VB6 program, you may be able to convert the program to use ADO, the use of which is described in this blog article. You might try using Process Monitor (available from Microsoft’s website) to determine what missing files or registry entries are causing the ActiveX error.